In certain cases, conservative composite resin fillings may be indicated instead of porcelain and gold inlays and onlays. Composite resin can be used to replace areas of decay, discoloration and excessive wear. It is also the perfect material to fill notches at the gumline and defects caused by abrasion and occlusal trauma. Finally, we use composite to enhance esthetics and reshape teeth, such as elimination of black triangles. We do not place silver amalgam restorations at our practice. We offer local anesthesia along with sedation, if necessary, to ensure maximum comfort for our patients. Below are just a few examples of our own patients' treatments with composite resin. 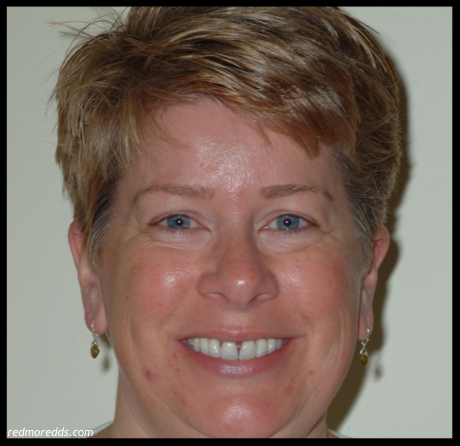 This patient had severe staining on her front teeth; Dr Predmore restored her teeth with conservative composite resin veneers. This patient had spaces between her front teeth which were filled with natural looking composite resin. Sensitive notching and exposed root surface at the gumline, restored with tooth-colored composite resin.